To Cite: Jafari D, Jamshidi K, Hajialilo Sami S, Shariatzadeh H, Najd Mazhar F, et al. 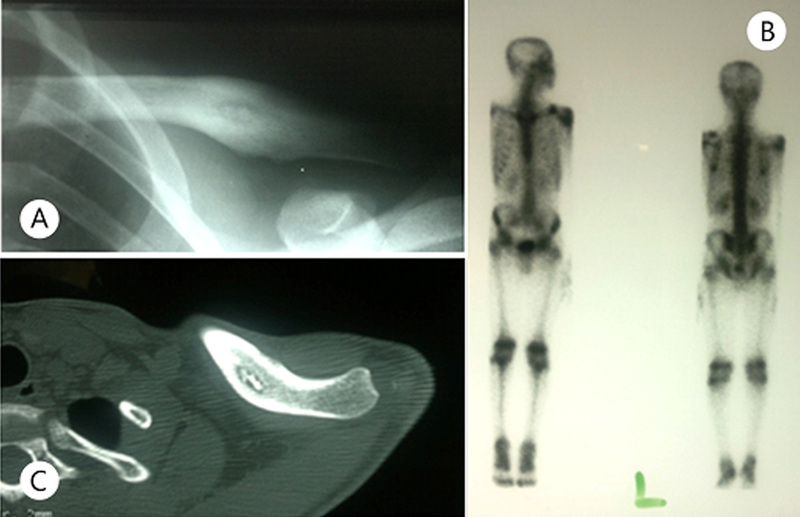 Osteoid Osteoma of the Upper Extremity: a Report of 35 Cases, Shafa Ortho J. 2014 ; 1(1):e47. Background: The upper extremity bones are infrequent sites for osteoid osteoma. Diagnosis of this tumor could be difficult and challenging. Materials and Methods: Thirty five patients with histologically confirmed osteoid osteoma of the upper extremity seen from 1992 to 2011 were studied retrospectively. Results: The patients' age at presentation averaged 23.4 years. Male to female ratio was 4 and right to left side ratio was 4, too. Twenty-five of the lesions were located in the wrist and hand, six around elbow, three around shoulder joint and one in radius diaphysis. Pain was present in all cases. Of 27 patients who took no steroidal anti-inflammatory drugs (NSAID) for pain, 20 obtained at least partial relief. Mass or swelling was more commonly noted in lesions of the hand and wrist as compared to the arm and forearm. Conclusions: Osteoid osteoma, relatively rare lesions in the upper extremity, could be a persistent source of hand, wrist, elbow or shoulder pain. Patients under age 40 who have otherwise unexplained pain should be evaluated in this regard. Osteoid osteoma is a relatively uncommon benign osteoblastic tumor, first described by Jaffe in 1935. It consists of an area of variably calcified osteoid tissue within a stroma of relatively loose vascular connective tissue. A rim of sclerotic reactive bone, less than 1 cm in diameter, surrounds the lesion (1). The most frequent location of osteoid osteoma is the lower extremity (2). Between 19% and 31% of all osteoid osteoma occur in the upper extremity. Of all cases of osteoid osteoma, lesions in the hand and wrist comprise 5% to 15% (3). Most osteoid osteomas occur in the second or third decades of life. The most common complaint is pain, often described as being more sever at night. From 1.6% to 5% of osteoid osteoma are painless and mostly occur in the fingers. Pain is often relieved by nonsteroidal anti-inflammatory drugs (NSAID). The second most common complaint is swelling, which is often the presenting symptom of a painless osteoid osteoma (4-6). The male to female ratio is more than 2:1 (3, 4). We report a case series including 35 cases of osteoid osteoma of the upper extremity over a period of 20 years. To conduct the study we obtained approval from our institutional review board. Records of 35 patients with pathological reports of osteoid osteoma in upper extremity were reviewed. All patients underwent surgery by departments of hand and tumor at Shafa Orthopedic Hospital during 1992-2011. Patients' data, signs, symptoms, history of trauma, night pain, relief of pain by NSAIDs and duration from onset of symptoms to operation were recorded. The diagnosis was made based on plain x-rays, three- phase technetium bone scans, CT scan and MRI. Histological examination confirmed the diagnosis in all cases. There were 28 men and 7 women, with an average age of 23.4 years (range: 13-46 years).Twenty eight osteoid osteoma were in the right and 7 in the left side. Fifteen were in finger phalanges (10 proximal and 5 distal phalanges), 4 in metacarpals, 5 in wrist (2 in scaphoid, 2 in capitate and 1 in trapezium), 2 in distal radius, 2 in olecranon, 4 in distal humerus, 1 in proximal humerus, 1 in clavicle and 1 in scapula (Figure 1). The pain was present in all cases and aggravated at 31 cases nightly. Of 27 patients who took NSAIDs 20 obtained at least partial pain relief. The physical findings varied with the site of the tumor. In the phalanges, osteoid osteoma induced marked fusiform soft tissue swelling. The mean delay from the onset of symptoms to the definitive treatment was 19 months (range, 3 months to 4 years). Three-phase Technetium- 99 bone scan was applied in 28 cases, showing an intense well-defined focal area increased activity during all the three-phase of the scan (Figure 2 B and Figure 3 B). In five cases, the bone scans were non- specific, showing a diffuse increase in isotope uptake (one in proximal humerus, two in distal humerus and two in wrist). CT scans was performed in 24 patients, and showed obvious lytic lesion with a central granular opacity surrounded by a well-defined sclerotic margin in all except one (Figure 2 C and Figure 3 C). MRI was performed on 18 cases, and clearly showed an intense soft tissue reaction around the lesion (Figure 3 D). Twenty seven patients received surgical treatment with excisional biopsy (en bloc resection), 7 with curettage and bone grafting, and only 1 with resection and bone grafting. Histological examination confirmed the diagnosis in all cases. Osteoid osteoma usually becomes symptomatic in the second or third decades of life, rarely presenting in patients over 40 years of age (3, 4, 7, 8). Approximately twice as many men as women are affected. At our report men to women ratio was 4 and 80% of tumors were at right side. Thirty four tumor cases (97%) were in patients in the second, third or fourth decades of life and only in one patient with over 40 years of age. This finding was in association with other reports (Figure 1). Between 19% and 31% of all osteoid osteoma occur in the upper extremity. Of all cases of osteoid osteoma, lesions in the hand and wrist comprise 5% to 15% (3, 4). Bender et al. 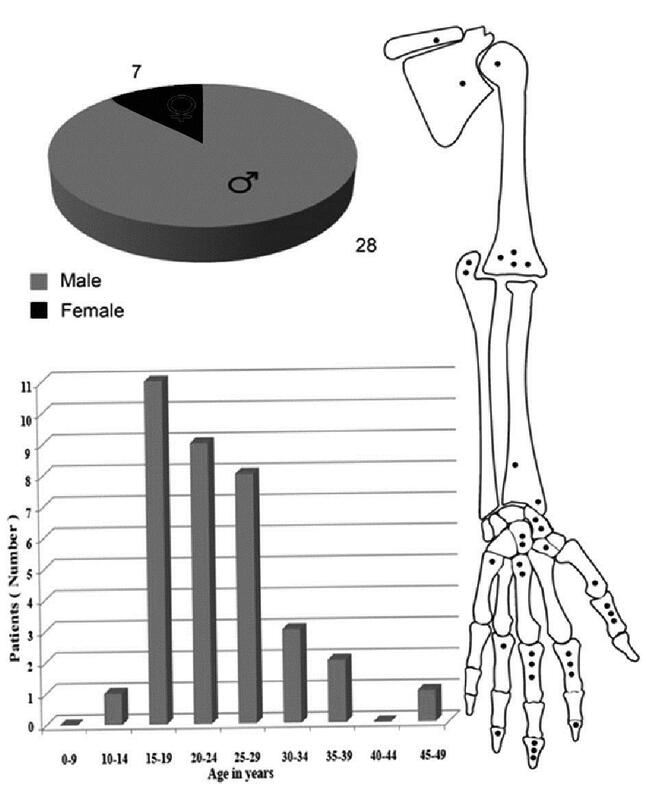 (4) examined the distribution of 46 osteoid osteomas identified in the upper extremity. Sixteen lesions were in the humerus, 7 in the ulna and 4 in the radius. In the carpus, 4 lesions were in the scaphoid and 2 in the capitate. There were 2 metacarpal, 8 proximal phalangeal and 3 distal phalangeal tumors. The lesions were then further divided by proximity to joints. Eight occurred around shoulder, 10 around the elbow and 11 around the wrist. Twenty four lesions, then, were located in the wrist and hand (52%) and 22 in the arm and forearm (48%) (4). In our study, 71% of osteoid osteomas were at wrist and hand location and only 29% were at another portion of upper extremity. Our findings were slightly different with the Bender et al. (4) study results. Ghiam and Bora (9) described 3 carpal osteoid osteomas in 2 patients and combined these with cases in the literature to establish a series of 26 cases of carpal osteoid osteo-mas. The scaphoid was the most commonly involved bone with the hamate second and the capitate the third most frequently involved carpal bone (9). We have only 5 cases in the carpal bone (two cases in the scaphoid, two cases in the capitate and one case in the trapezoid bone). The most common complaint was pain, of-ten described as being more severe at night. The disparity between intense pain and the small physical size of the lesion is probably explained by the presence of nerve fibers and high vascularity within the nidal and perinidal tissues (10-12). The extremely vascular nature of the lesion increases tension and edema, causing the pain by direct stimulation of local nerves around the intraosseous vessels (13, 14). Markedly elevated levels of prostaglandin E-2 have been reported in osteoid osteoma (15). The presence of inflammatory cells around blood vessels and nerves were related to pain. Pain is often relieved by NSAID (1, 13, 14) and is not, however, universal. From 1.6% to 5% of osteoid osteomas are painless and most painless lesions occur in the finger (3). We had no painless osteoid osteoma. Healey (7) reported that 73% of 19 patients had improvement of symptom after aspirin treatment. In the series presented by Bender et al., 86% of patients with an osteoid osteoma of the upper extremity reported pain relief after NSAID use (3). We evaluated response to NSAID only in 27 patients and found relief of pain in 20 patients (74%). The second most common complaint is swelling, which is often the presenting symptom of a painless osteoid osteoma. Of 22 patients in the Bender series noted to have swelling, 17 had swelling in the hand and wrist (3). In our series, 25 patients had swelling and only two patients with osteoid osteoma of the hand and wrist had not. In the hand and wrist, point tenderness is characteristic, as in 23 of the 26 carpal cases reviewed by Ghiam and Bora (9). We observed point tenderness in 18 of 25 wrist and hand osteoid osteomas. The classic radiographic picture of an osteoid osteoma is an area of sclerosis with a central region of lucency. Sclerosis may be the sole radiographic finding in early cases, because radiographic evidence of the radius lucent nidus may not be seen for 6 to 12 months after the onset of symptom (Figure 2 A and Figure 3 A). Because of the unusual radio-graphic presentation of some osteoid osteo-ma, many are not diagnosed by plain radiography. Swee et al. (12) reported that 25% of osteoid osteomas are not demonstrable on plain radiographs (12). In Bender et al. study of upper extremity lesions, the diagnosis was suggested by radiography alone in only 35 of 46 cases (76%) (3). In our study radi-ographic findings were: sclerosis in 25 cases, lucency in 20 cases and nidus in 18 cases at plain radiography. 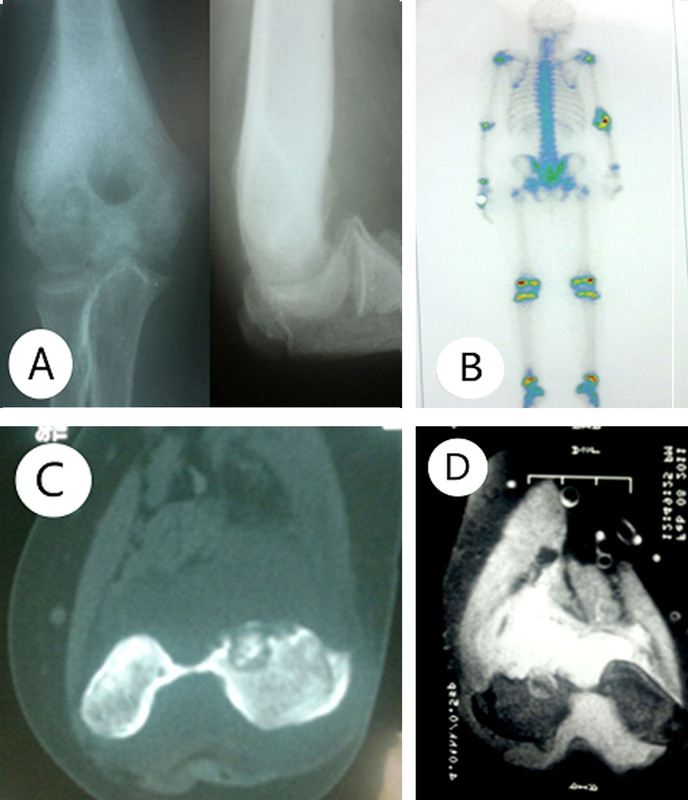 We demonstrated osteoid osteoma on plain radiographs in 25 of 35cases (71%), that was in association with Bender et al. study. In addition to plain radiographs, bone scans and tomography are helpful in establish the diagnosis of an osteoid osteoma. Although, individual case reports have documented negative bone scans with histologically documented osteoid osteomas (13, 14). Most osteoid osteomas are clearly seen in the early and delayed images of a technetium bone scan. In our study, bone scan was applied in 28 patients and all were positive (Figure 2 B and Figure 3 B). CT scans are helpful in localizing the lesion preoperatively (3). In our study, CT scan was performed for 24 patients and was helpful in localizing and detection of nidus in all cases (Figure 2-C and Figure 3 C). MRI was performed in 16 cases, and clearly showed an intense soft tissue reaction around the lesion (D).D). While symptomatic relief can be obtained with NSAID, most notably aspirin, definitive treatment usually requires surgical excision of the nidus. In most instances symp-toms will persist if the nidus remains, partially or entirely (3). Excision of the lesion may be performed by intralesional, marginal or wide excision. In Bender et al. study of 46 surgically excised upper extremity osteoid osteomas revealed 6 persistent lesions. Five occurred in the hand or wrist, whereas one was in the humerus (4). In our study 8 recurrences were seen. Inadequate bone resection and persistence of nidus were seen in all patients (3 complete and 5 partial nidus persis-tence). Two of 8 recurrences were treated by radiofrequency ablation (one in the clavicle and one in the distal of humerus) and 6 of 8 reoperated (1 in proximal humerus, 4 in phalanx and 1 in metacarpal bone). All of 8 recurrences were pain free after second pro-cedure. Figure 2. Osteoid osteoma of the clavicle. A. Radiography of left clavicle of a 17 year-old boy with shoulder pain in the previous 12 months. Image B shows lucency with nidus and bone reaction. Bone scan shows increased uptake at mid clavicle. C. The CT scan is helpful in detection and localizing the nidus. Osteoid osteoma is a relatively rare lesion in the upper extremity and could be a persistent source of hand, wrist elbow or shoulder pain. Patients under age 40 who have other-wise unexplained pain should be evaluated. Relief of pain with oral NSAID, most notably aspirin, should suggest the possibility of osteoid osteoma. Point tenderness is important symptom in hand and wrist osteoid osteomas. Radiographs should be examined for sclerosis in the region of pain. If the radiograph was non-diagnostic, a bone scan should be obtained. If the nidus could not be clearly visualized by radiography and bone scan, a CT scan should be obtained. Osteoid osteoma should be included in differential diagnosis in cases presenting with upper extremity pain especially in young males.